Google has switched tack in its effort to popularise augmented reality (AR) on Android by moving away from a requirement for devices to be fitted with special depth sensors. Instead, it is building software for developers to help them mix graphics with real-world views using common camera and motion-tracking hardware. The rethink brings it in line with rival Apple's mixed-reality strategy. By coincidence, Apple has just unveiled several in-development AR apps for iOS. All of the third-party apps have been developed since Apple unveiled its ARKit software at its WWDC developers conference 12 weeks ago. The products will be released to the public once Apple releases the iOS 11 version of its mobile operating system. However, the processor demands of the software mean that users will not be able to run the AR apps on iPhone 6, iPad Air 2 or earlier products. Although the AR-themed Pokemon Go has already proved popular on iOS, ARKit helps anchor objects to locations and makes it easier to take account of lighting conditions, among other benefits. Google has named its competing software development kit ARCore. 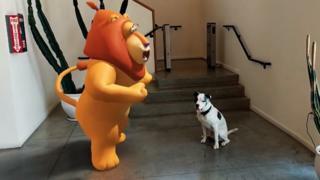 A video published on YouTube shows it being used to superimpose cartoon objects on a tabletop and street, and it has animated characters reacting to real people and pets. A test version has already been released that runs on Google's Pixel phones and Samsung's Galaxy S8 handsets. Google blogged that it was also working with Huawei, LG, Asus and others to bring it to further handsets. "We're targeting 100 million devices at the end of the preview," it added. Until now, Google's AR efforts have focused on Project Tango - an initiative that used an infrared projector and sensor to take depth measurements. However, despite being announced more three years ago, only two products incorporating the technology have gone on sale to the public - the Lenovo Phab 2 Pro and the Asus ZenFone AR. Neither of the phones have been best-sellers and partly as a result few app developers have been attracted to the platform. Although Google says that ARCore was "built on" Tango, the news site Ars Technica has reported that the newer technology was created by a different team of engineers who were being given access to a lot more resources. "Apple is about to get about 500 million people into AR all in one quarter thanks to iOS 11," Robert Scoble, a mixed-reality consultant at the Transformation Group, told the BBC. "This represented a real threat to Android and Google has responded with a fairly interesting effort with ARCore. "But I hear there's another shoe to drop on 12 September when we expect to see Apple announce new iPhones. This battle is just beginning."